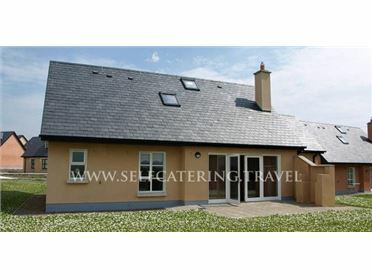 Luxurious Lake House residence in an enviable location with breath-taking views of Caragh Lake, Seefin Mountain and the Dingle Peninsula. This is a superior family home which has been tastefully finished and fitted to exacting standards, while still retaining all its original characteristics and charm. An impressive central living area features floor-to-ceiling sliding glass doors which overlook a large stone patio, expansive lawns and 70 meters of private lakefront. With a big open fireplace, tasteful furniture and original paintings, it's the perfect place to relax and savour breath-taking views morning, noon and night. The large kitchen is fully equipped, perfect for preparing those delicious meals - the trout you caught earlier that day or fresh local vegetables you bought in the nearby town. There's also a long oak bench to lounge on, sip your tea and look out onto the lake. The dining room features large floor-to-ceiling windows and antique furniture - the ideal setting for those long and lazy lunches and magical evening meals with friends. The house sleeps 12+ people with six bedrooms and six bathrooms - two en-suite doubles, one en-suite twin, plus a further three double bedrooms, with three additional bathrooms. The beds are cosy and comfortable with goose down quilts and 100% cotton sateen linen. For those lazier days both living areas have widescreen cable TV with Irish, English, German, French and other international channels; plus strong wifi throughout, free of charge - 10MB down, 3MB up. Outside there's a raised stone patio overlooking the lush green lawn and private lakefront, with ample seating - benches, loungers, table and chairs - to relax and dine al fresco, along with a Weber barbecue and smoker - perfect for those long summer evenings.